september 2016 | 438 blz. 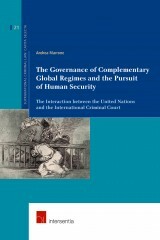 This book offers an overview of the challenges occurring in the emerging regime of international criminal justice as a tool of sustainable peace. It illustrates the impact of such regime in international law and international relations focusing on the obstacles and concerns of its governance in the context of the maintenance and restoration of international peace and security.